Follow as many other blogs as you want. The more you follow, the more that will follow you back! 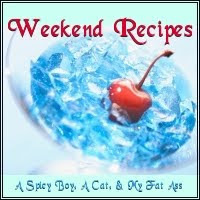 Be sure to tell them that you're following from Weekend Recipes! You may also want to leave a link to your blog so they can return your follow more easily. Here's my Weekend Recipe for Baklava... hope you enjoy! 1.Preheat oven to 350 degrees F(175 degrees C). Butter the bottoms and sides of a 9x13 inch pan. 2.Chop nuts and toss with cinnamon. Set aside. Unroll phyllo dough. Cut whole stack in half to fit pan. Cover phyllo with a dampened cloth to keep from drying out as you work. Place two sheets of dough in pan, butter thoroughly. Repeat until you have 8 sheets layered. Sprinkle 2 - 3 tablespoons of nut mixture on top. Top with two sheets of dough, butter, nuts, layering as you go. The top layer should be about 6 - 8 sheets deep. 3.Using a sharp knife cut into diamond or square shapes all the way to the bottom of the pan. You may cut into 4 long rows the make diagonal cuts. Bake for about 50 minutes until baklava is golden and crisp. 4.Make sauce while baklava is baking. Boil sugar and water until sugar is melted. Add vanilla and honey. You may add a pinch of ground cordamom if you desire. Simmer for about 20 minutes. 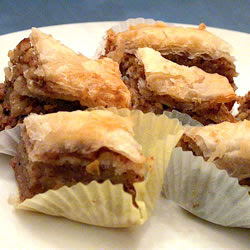 5.Remove baklava from oven and immediately spoon sauce over it. Let cool. Serve in cupcake papers. This freezes well. Leave it uncovered as it gets soggy if it is wrapped up. Printing this out! I LOVE baklava! Thank you for your comment on my last post. It was such a hard day and the comments were wonderful to read. I'm going to be writing an update in a little bit. make sure while assembling the layers of filo, that you have the unused portion under a moist dish towel or they will dry out.